The effects of partitioning of Mn and Si during intercritical annealing on the transformation behavior and mechanical properties of low alloyed TRIP-assisted steel sheets were investigated by using 0.17%C-1.5%Si-1.7%Mn steel. During intercritical annealing, Mn and Si concentrated in austenite and ferrite by partitioning, respectively. 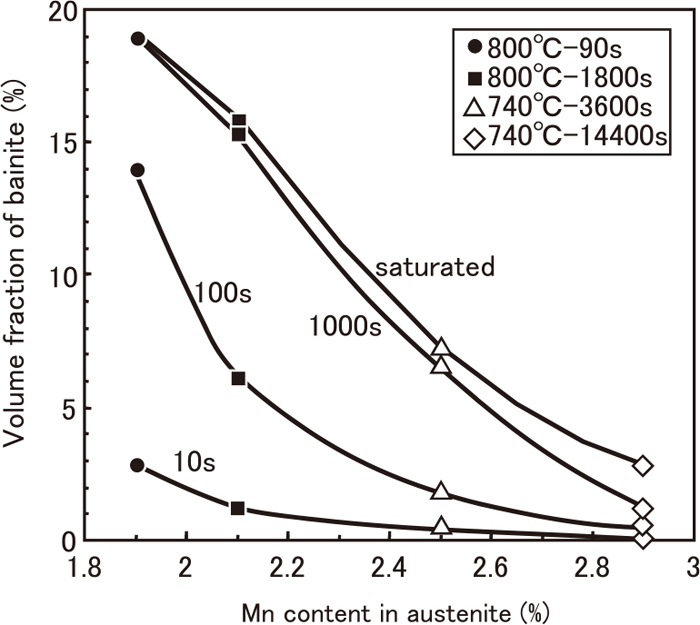 This partitioning of Mn and Si suppressed the bainite transformation during austempering and decreased the volume fraction of retained austenite and its C content. This is considered to be mainly because partitioning of Mn and Si shifted the T0’ curve to the lower C concentration region and stopped the bainite transformation at a lower C concentration in residual austenite. The decrease in the volume fraction of retained austenite and its C content deteriorated the ductility of the low alloyed TRIP-assisted steel sheets. Although proper intercritical annealing is necessary in order to increase the C content in retained austenite, it should be noted that excessive intercritical annealing can deteriorate the ductility of low alloyed TRIP-assisted steel sheets by causing excessive partitioning of Mn and Si.